Oracle expects revenue to grow between 4% and 6% in the current quarter. Oracle's quarterly profit blew past Wall Street estimates and the business software maker forecast upbeat current-quarter earnings, indicating the company's transition to cloud is starting to pay off. The company's shares were up 10.6% to a record high of $51.25 in after-market trading yesterday. They had gained about 20% this year. A late entrant to the cloud market, Oracle has been doubling down on efforts to bolster its cloud-based services as customers increasingly shun the costlier licensing model. As part of the efforts, the company and AT&T signed in May a deal under which the US telecom provider agreed to move some of its large-scale databases to Oracle's cloud platform. "In the coming year, I expect more of our big customers to migrate their Oracle databases and database applications to the Oracle Cloud," Oracle founder and CTO Larry Ellison said in a statement. Total cloud revenue surged 58.4% to $1.36 billion in the fourth quarter ended 31 May. "After several years of struggling to find its footing in cloud, Oracle seems to have turned the corner and heads into its fiscal 2018 with significant momentum," said Josh Olson, analyst at Edward Jones. The success in the cloud business was highlighted by company executives on a post-earnings call. "We sold more than $2 billion in cloud annually recurring revenue. This is the second year in a row that we sold more cloud ARR than Salesforce.com," Ellison said on the call. Buoyed by the growth in cloud, the company forecast first-quarter adjusted profit of between 59 cents and 61 cents per share on a constant currency basis, while analysts were expecting 59 cents. On a constant currency basis, Oracle said it expected revenue to grow between 4% and 6% in the current quarter. To increase its competitiveness in the cloud market, Oracle has also acquired companies including NetSuite, its largest purchase to date. Meanwhile, Oracle's hardware revenue declined 13.2% to $1.11 billion and new software licences fell 5.1% to $2.63 billion in the latest quarter. Net income rose to $3.23 billion, or 76 cents per share, in the fourth quarter, from $2.81 billion, or 66 cents per share, a year earlier. 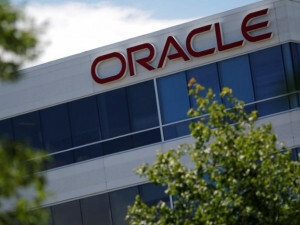 Excluding items, Oracle earned 89 cents per share. The company reported adjusted revenue of $10.94 billion. Analysts on average had estimated a profit of 78 cents per share and revenue of $10.45 billion, according to Thomson Reuters.